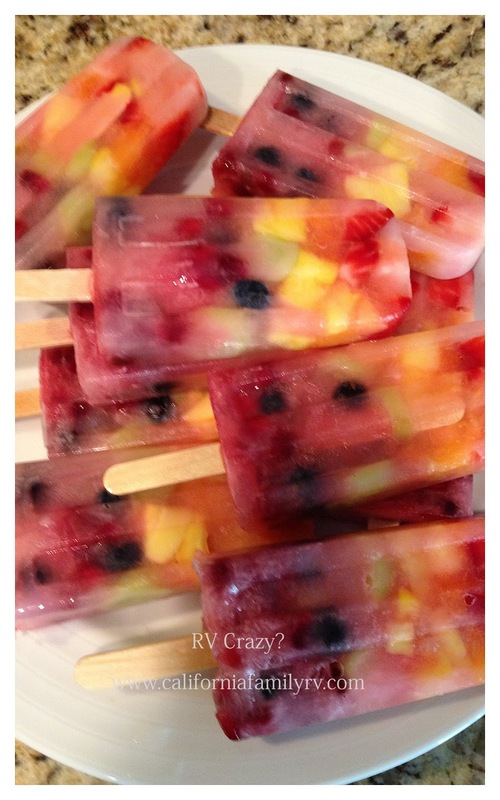 Need a delicious, healthy (ish) and pretty cool snack for summer? I did too, so I decided to make "Rainbow Pops" as we call them in our house. Very easy to make, and a big hit with all of our kids. Lemonade (or any other clear juice of your choice). I use this recipe for homemade lemonade, and it's AWESOME! Popsicle Molds: I use these BPA-free ones I got on amazon.com. 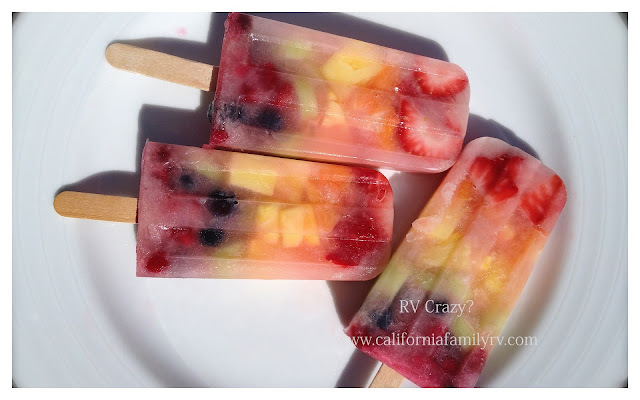 I can make many pops at once and even pull them out and put in large freezer bags for RV trips. Wash and slice fruit into little bite-size pieces that will easily fit in your molds. Place fruit in molds in stripes of color, beginning with red at the bottom of your mold. For example, put one line of strawberries at bottom. Place stripe of oranges on top of the strawberries. Continue with pineapple, grapes and blueberries, and finish with a stripe of pomegranates on top. Be careful not to smash too much fruit in, as you need to leave room for the liquid to fill spaces between them, and for your stick to fit in the mold. (Use your leftover fruit for a beautiful fruit salad). After fruit is placed in molds, carefully pour lemonade (or juice) over the fruit to fill the molds. Place sticks in, and put in freezer overnight. Carefully pour warm water over molds, and gently pull rainbow pops out. Enjoy! Now, I can bag these babies up, put them in the freezer and use my empty molds to make even more pops. 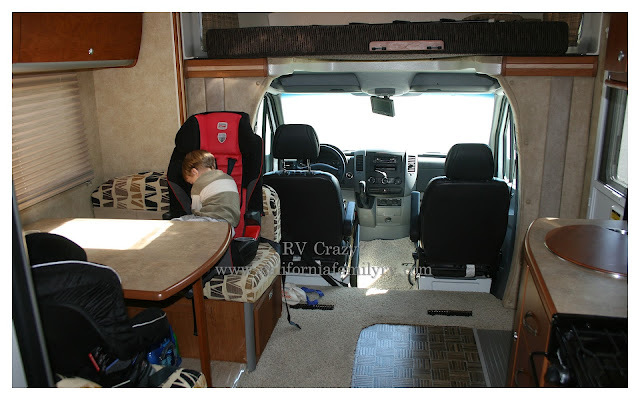 Makes it very convenient for a busy mom. I also bring homemade pops with us on rv trips. They are refreshing and delicious...especially after a long hike or bike ride. get out! These are AWESOME! Yum yum!..Hello!!! !